Background: Ensuring adherence to prescribed smoking cessation medications, such as Champix® (varenicline), is essential during a quit attempt as non-adherence can significantly reduce the likelihood of achieving prolonged smoking abstinence. The use of dose administration aids may improve adherence, though medication stability on repackaging is not guaranteed, due to a lack of available data from manufacturers supporting this practice. Objective: To determine the suitability for repackaging varenicline tartrate tablets into a dose administration aid, by assessing its physical and chemical stability after being repackaged and stored at ambient conditions for 6 weeks. Methods: Varenicline tartrate (1.0 mg) tablets were repackaged into commercially available Webster-pak® blister compartments and stored for 42 days at ambient conditions characteristic of a Zone IVB climate (30 ± 2°C and 75 ± 5% relative humidity) according to the World Health Organization (WHO) guidelines on pharmaceutical stability testing. Physical and chemical tests were performed on the repackaged and control tablets, including an assessment of: tablet thickness, hardness, weight uniformity, friability, dissolution, disintegration, and content uniformity after exposure to ambient conditions and light according to International Council on Harmonisation of Technical Requirements of Pharmaceuticals for Human Use guideline Q1B. Results: Weight, friability, and thickness of the tablets complied with compendial standards. A validated high performance liquid chromatography method was used to confirm that after exposure to light, and repackaging at 30°C/75% relative humidity, the tablets remained within the required 95%–105% of the stated drug content. However, tablet hardness and disintegration decreased over time, with tablets becoming softer and undergoing more rapid disintegration in water. Conclusion: Repackaging 1.0 mg varenicline tartrate tablets into a dose administration aid can be undertaken to improve adherence rates and therefore smoking abstinence rates. This can be performed without compromising either the physical or chemical stability of the tablets. Webster-pak® is a commonly utilized DAA device in community pharmacies in Australia, though they are often used without the availability of published data on the stability of individually repackaged medications. Commonly used and repackaged medications such as aspirin, atenolol, furosemide, and sodium valproate have all been reported to demonstrate physical or chemical instability upon repackaging.12-17 The objective of this research was thus to determine the physical and chemical stability of varenicline tartrate, when repackaged into a DAA and stored under ambient temperature and humidity conditions in order to recommend its suitability for repackaging in clinical practice. To determine whether commercial varenicline tartrate tablets are suitable for repackaging, tests were performed to identify any issues in relation to physical or chemical stability between the repackaged and control tablets. Varenicline tablets were purchased from a local pharmacy, removed from their original packaging, and repackaged individually into Multi Dose Webster-pak blister compartments. Gloves and plastic packing tweezers were used to handle tablets, and all tablets had a remaining shelf-life of at least 9 months at the time of sampling. Dissolution was measured for six tablets using a Vankel VK7000 dissolution apparatus with a 100 mL vessel by placing a 1.0 mg varenicline tartrate tablet in 100 mL of reverse osmosis water (pH 5.2) at 37 ± 0.5°C. The rotating paddle was set to 100 r/min, and samples withdrawn at 0 and 45 minutes. Samples were assessed for drug content using high performance liquid chromatography (HPLC) (see following section). The dissolution results were analyzed using a two-tailed Mann-Whitney U test (p = 0.05), performed with IBM SPSS Statistics Version 23 (IBM Corp., Armonk, NY, USA). Varenicline tartrate content was measured using an HPLC method validated for specificity, linearity, accuracy, and precision as per the International Council on Harmonisation of Technical Requirements of Pharmaceuticals for Human Use (ICH) guideline Q2/R1.20 A Nexera-i LC-2040C 3D liquid chromatograph was used to perform content analysis on samples, using a mobile phase composed of 12% acetonitrile, 88% water, and 0.1% formic acid. An XSelect HSS T3 5 µm (4.6 mm × 250 mm) column was used with a flow rate of 1 mL/min, heated to 40°C. The detection wavelength was set at 237 nm, and the injection volume at 10 µL. Photostability testing involved placing 20 tablets in a Webster-pak within a Heraeus Suntest CPS+ with a Solar ID65 filter and irradiating at 500 watt/m2 for 10.6 hours, equating to 1.2 million lux hours of exposure to visible light, and 496 WH/m2 of ultraviolet light. This is in accordance with minimum exposure requirements in ICH guideline Q1B.21 A control of 20 tablets (wrapped in aluminum foil) was used to determine the effect of temperature. Content analysis was conducted on control samples, covered and exposed photostability samples, and samples from the tablets stored at ambient conditions. Samples were prepared by crushing 20 tablets in a mortar and pestle, weighing out an amount of powder equivalent to one varenicline tartrate tablet, and dissolving in water. Samples were filtered through a Millex-GP 0.22 µm polyethersulfone-membrane express filter and analyzed by HPLC using a calibration curve in the range of 0 to 20 µg/L. Tablet appearance did not change after storage under ambient conditions, or after exposure to visible and ultraviolet light, with each tablet retaining their blue hue and oblong shape. 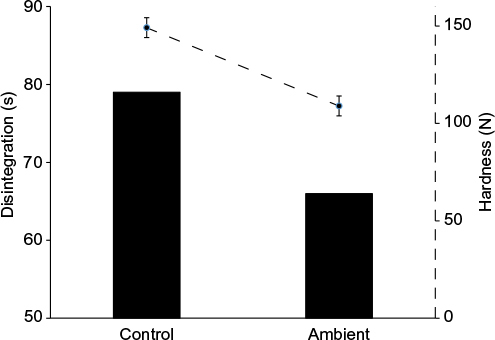 A minor increase in tablet weight and thickness occurred after storage at ambient temperature and humidity, with the average tablet weight increasing by 1%, and average tablet thickness increasing by 4%. Significant changes in tablet hardness occurred, with the mean pressure to break the control tablets being 151 N, which decreased by 27% after storage at ambient conditions, to an average of 110 N. These changes led to brief adhesion to the sides of blister cells, though tablets dislodged quickly when moving the DAA, and did not cause any visual residue on the sides of the blister cells. Disintegration times were also reduced, with control tablets disintegrating in 79 seconds, compared to 66 seconds for the ambient tablets, a reduction of 16%. Figure 1 illustrates the changes in hardness and disintegration times and the relationship between these two physical characteristics. Friability testing resulted in a small amount of weight gain per tablet in both groups, with tablets in the control group gaining an average of 85 µg, compared to 260 µg in the ambient group. Tablet dissolution was unaffected by the repackaging process, with samples taken after 45 minutes averaging 92% of drug content dissolved for the control tablets, and 93% for the tablets stored at ambient conditions (p = 0.887). Figure 1 Variation in 1.0 mg varenicline tartrate tablet disintegration times (bars) and hardness (dotted line) between control tablets, and tablets stored at ambient conditions for 6 weeks. Note: Error bars represent 95% confidence intervals about the mean for n = 10 samples. Content analysis results of the covered tablets and the tablets exposed to light, and control tablets and those stored at ambient conditions (30°C/75% relative humidity) were all within the requirements of the compendial standard. There was no significant difference in varenicline tartrate content between the four groups. Table 1 displays the content averages and 95% confidence intervals for the samples taken from the tablets within each group. Notes: α = 30 ± 2°C and 75 ± 5% relative humidity for 42 days; β = 1.2 million lux hours visible light and 496 WH/m2 ultraviolet light. Ensuring the physical and chemical stability of medications is essential when attempting to reduce patient error and improve medication adherence by repackaging into a DAA such as a Webster-pak.8-12 Varenicline tartrate content was not affected by repackaging and storage for 6 weeks at the worst temperature and humidity conditions for long-term stability testing recognized by the WHO.22 Though the 0.5 mg varenicline tablets were not tested, it is not believed their results would differ from the 1.0 mg tablets, as the only excipient difference is the coloring agent, and their duration of use in varenicline therapy is only 7 days at the beginning of therapy, minimizing their duration in the DAA. While Webster-pak blister compartments assist in adherence when using multiple medications through the repackaging of tablets into individual compartments protected by an aluminum backing, the lack of a cardboard sleeve and the presence of a larger internal area for oxygen and moisture result in an increased exposure to light, oxygen, and moisture. An issue not addressed in this study is the potential for surface interactions between multiple medications packaged within the same blister compartment. Whilst individual varenicline tartrate tablets can be safely repackaged into their own Webster-pak blister compartments, further research is required to assess this effect in other forms of DAAs. There is also the need to assess the likelihood of surface interactions and subsequent degradation of either varenicline or other medications in contact with each other. The DAA utilized in this study is one of the most commonly used in Australia, with pharmacists often seeking evidence-based recommendations on safe repackaging practices, as manufacturer assurances on stability are invalidated through repackaging. This is needed for both long-term and short-term medications, and those with unusual loading or unloading periods, such as varenicline tartrate. This study shows that 1.0 mg varenicline tartrate tablets repackaged in a Webster-pak will remain stable for a reasonable in-use period of 6 weeks when stored appropriately in tropical climates. The authors would like to acknowledge Pfizer Inc. for the donation of the pure varenicline tartrate powder for HPLC method development, and Webstercare for their donation of Webster-pak blister compartments to the authors for use in the stability testing. This research received no specific grant from any funding agency, commercial, or not-for-profit sectors. Sabatè E, editor. Adherence to Long-Term Therapies: Evidence for Action. Geneva, Switzerland: World Health Organization; 2003. Vrijens B, De Geest S, Hughes DA, et al. A new taxonomy for describing and defining adherence to medications. Br J Clin Pharmacol. 2012; 73(5):691–705. Balmford J, Borland R, Hammond D, Cummings KM. Adherence to and reasons for premature discontinuations from stop-smoking medications: data from the ITC Four-Country Survey. Nicotine Tob Res. 2011;13(2):94–102. Liberman JN, Lichtenfeld MJ, Galaznik A, et al. Adherence to varenicline and associated smoking cessation in a community-based patient setting. J Manag Care Pharm. 2013;19(2):125–131. Catz SL, Jack LM, McClure JB, et al. Adherence to varenicline in the COMPASS smoking cessation intervention trial. Nicotine Tob Res. 2011;13(5):361–368. Haywood A, Glass BD. Evidence of stability of medicines repackaged in compliance aids: a review. Curr Drug Saf. 2016;11(1):69–77. Roberts M, Stokes J, Ientile C, Lewis G, Doran C, Haywood A, et al. Effectiveness and cost effectiveness of dose administration aids (DAAs): Phase 3 Final report. Quality Medication Care Pty Ltd & Therapeutic Research Unit, School of Medicine, University of Queensland, 2006. Available from http://6cpa.com.au/wp-content/uploads/Effectiveness-and-cost-effectiveness-of-Dose-Administration-Aids-phase-3-DAA-phase-3-Final-Report.pdf . Accessed December 15, 2016. Glass BD, Haywood A, Llewelyn V, Mangan M. Compliance aids and medicine stability: new evidence of quality assurance. Curr Drug Saf. 2009;4(1):74–78. Church C, Smith J. How stable are medicines moved from original packs into compliance aids? Pharm J. 2006;276(7384):75–81. Mylrea M, Robertson S, Haywood A, Glass B, Fersterer C. Clinical pharmacy: Dispersible aspirin tablets repackaged into dosette boxes: Caution in Practice. Australas J Pharm. 2013;94(1113):60-63. Chan K, Swinden J, Donyai P. Pilot study of the short-term physio-chemical stability of atenolol tablets stored in a multi-compartment compliance aid. Eur J Hosp Pharm Sci Pract. 2007;13(3):60–66. Donyai P. Quality of medicines stored together in multi-compartment compliance aids. J Clin Pharm Ther. 2010;35(5):533–543. Bowen L, Mangan M, Haywood A, Glass BD. Stability of frusemide tablets repackaged in dose administration aids. Journal of Pharmacy Practice and Research. 2007;37(3):178–181. Llewelyn VK, Mangan MF, Glass BD. Stability of sodium valproate tablets repackaged in dose administration aids. J Pharm Pharmacol. 2010;62(7):838–843. Redmayne B, Robertson S, Kockler J, Llewelyn V, Haywood A, Glass B. Repackaged sodium valproate tablets--meeting quality and adherence to ensure seizure control. Seizure. 2015;31:108–111. Pharmaceutical Society of Australia [homepage on the Internet]. Dose Administration Aids Service: Guidelines and standards for pharmacists. Pharmaceutical Society of Australia, 2007. Available from: http://www.psa.org.au/practice-standards/dose-administration-aids-service. Accessed May 23, 2017. British Pharmacopoeia. Appendix XII. London: British Pharmacopoeia Commission; 2014. ICH Harmonised Tripartite Guideline. Validation of Analytical Procedures: Text and Methodology Q2(R1). Geneva: ICH Steering Committee; 2005. Available from: https://www.ich.org/fileadmin/Public_Web_Site/ICH_Products/Guidelines/Quality/Q2_R1/Step4/Q2_R1__Guideline.pdf. Accessed May 23, 2017. ICH Harmonised Tripartite Guideline. Stability Testing: Photostability testing of new drug substances and products Q1B. Geneva: ICH Steering Committee; 1996. Available from: https://www.ich.org/fileadmin/Public_Web_Site/ICH_Products/Guidelines/Quality/Q1B/Step4/Q1B_Guideline.pdf. Accessed May 23, 2017. World Health Organization. Stability Testing of active pharmaceutical ingredients and finished pharmaceutical products. World Health Organization Technical Report Series; 2009:953:87–130. Monthly Index of Medical Specialties. (2015). MIMS Full Prescribing Information: Champix. Revised July 1, 2015. Retrieved October 15, 2016. Monthly Index of Medical Specialties. (2015). Consumer Medicine Information: Champix. Revised October 2015. Retrieved October 15, 2016. Drovandi AD, Chen CC, Glass BD. Adverse effects cause varenicline discontinuation: a meta-analysis. Curr Drug Saf. 2016;11(1):78–85.